The 'Earthquake' singer brought Wembley Stadium to their feet to introduce The X Factor star on stage for a duet. 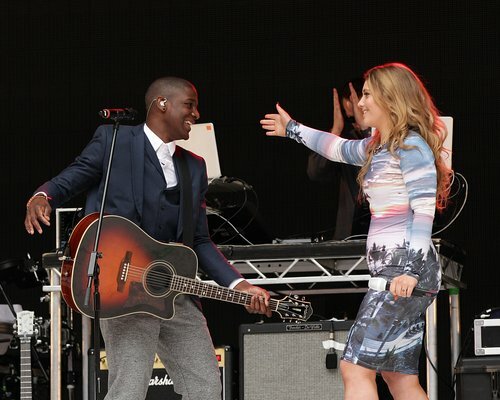 Labrinth gave the Capital FM Summertime Ball 2013crowd a huge surprise today (9th June) when he introduced fan-favourite The X Factor UK star Ella Henderson on stage for a duet. The popular 2012 contestant gave her first big performance in front of an 80,000 strong crowd at Wembley Stadium this evening when she joined the 'Let The Sun Shine' singer for a joint performance of his hit single 'Beneath Your Beautiful'. The memorable moment saw Ella taking on 'Clown' singer Emeli Sande's half of the duet for her Summertime Ball debut, and she wowed the Wembley audience with a powerful performance that had everyone singing along with the former Vodafone Big Top 40 number one. Ella rose to fame on the 2012 series of The X Factor UK and is gave fans a teaser of her new music last month when she unveiled a demo of a song called 'Waiting' to a huge response on Twitter. Labrinth's Summertime Ball set saw him thrilling the Capital FM listeners with all of his biggest songs to date, including 'Let The Sun Shine', 'Express Yourself' and his signature song 'Earthquake'. The UK singer-songwriter was performing on an all-star bill also featuring the likes of Robbie Williams, Taylor Swift, The Wanted and Jessie J. Keep it Capital for all the action from the Summertime Ball. On Capitalfm.com, we're bringing you all the latest news, gossip, pictures, videos and performances from the event, and stay tuned to our live blog for the best backstage action. On Twitter, keep it @CapitalOfficial using the hashtag #CapitalSTB and download the Capital App to watch all the live performances.